Different strokes for different folks, there are various reasons why people wear a tattoo. A popular reason for getting inked is to pay tribute to a dear someone you lost. Some use this to express a certain story and tattoo brings the story to life. Others are keeping up with the fad, a tattoo means you are up-to-date with the latest trend. But to Whang-od it is about an empty space in her right wrist that has a story to tell and not the tattoos all over her body. It was reserved for the man she loved. Her boyfriend was one of the casualties during World War II who fought the Japanese forces and the Filipino soldiers who stole their food. At almost 100-years old, Whang-od is the last living “mambabatok,” tattoo maker, in the Philippines and the last living bastion of the nearly extinct art form. She is a member of the Butubut tribe found in the mountainous village of Buscalan in Kalinga province. She is anything but poor, what she lacked in material wealth she makes up with her international recognition and respect. Whang-od is considered as one of the last living cultural treasures of the Philippines and there’s a clamor to declare her as a national artist. Thanks to her popularity, tourists flock to Buscalan village despite long hours of travel just to get inked by a legendary tattoo artist. The materials used by Whang-Od have been untouched by modernization it still maintains the ancient qualities over the years. These are a coconut bowl where water, charcoal, and sweet potato are combined to produce the tribal tattoo ink. Once the mixture is complete, it is tapped into the skin using a thorn from either a calamansi or lemon tree which is latched onto a 12-inch bamboo stick and a bamboo hammer. Choose from the array of designs that will be presented to you. As a sign of courtesy, visitors are encouraged to bring food, medicine, and matches for her daily needs aside from the tatoo cost between PHP 400 to 1,000. Due to her old age and poor health she is turning away the majority of the tattoo seekers. 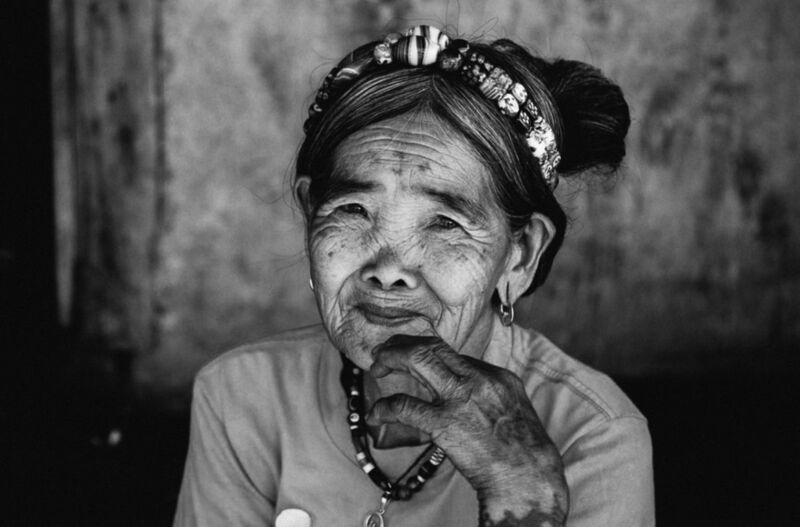 Whang-od has been tatooing for over 80 years including the Kalinga warriors who were known as ferocious headhunters. Each tatoo symbolizes every person they slayed in combat. The tatoo was a symbol of bravery of the fearless and skilled Kalinga warriors while weaklings have nothing to show. There is a plethora of design, from centipede on the arms which signify protectioon to the eagle in the chest which signify bravery. She also inked women ,the tatoo is considered as an indication of beauty and elegance that makes the wearer stand out from the crowd. Snakeskin and rice grain patterns usually cover the arms, alluring designs of dots,triangles, anmd crosses are decorated on the forehead. At times when Whang-Od is not practicing her craft, she takes care of her dog, chicken, and native pigs and feeds them twice a day. Hershey, her pet dog, was given by a visitor and her constant companion ever since. Buscalan is a small village and everybody knows everybody, she roams around and talks with neighbors. She makes beads and hand-woven textiles which are one of the major sources of income by the womenfolk. True to her boyfriend, Whang-od never married after his demise. Without a child to pass her baton, she is training her grandniece, Grace Palicas, and other tribal women to take over her place when she retires from the tattoo scene. She believes the tattoo would be infected if she taught other women outside of her tribe. Grace is more than willing to take her place and even participated in tattoo festivals around the Philippines. At her age, she’s not showing any signs of hanging the gloves. And there seems to be no shortage of people who want her signature tattoos on their body. Like any signature brand product, people who know will raise their eyebrows when they see one. A picky signature bag user knows how to distinguish a Hermes, from a Gucci, from a Givenchy, and certainly from a Cheapo. When you see a tattoo bearer wearing the design of Whang-od you will notice that it is hand-made, the design is unique, and you’ll be proud to wear it knowing that it was made by someone who loves the craft. Art + Culture + FestivalsCordillera Administrative RegionWhere to?